The fraternal organization, the Masquers Club, founded in Hollywood in 1925 by eight actors, prided itself on love, loyalty, and support. They lived by the motto: “We Laugh to Win,” a rallying cry whenever a brother was in need. They made two-reel films in the 1930s featuring dozens of members to raise money for paying off the mortgage on their new clubhouse as well as helping those in financial difficulties. During World War II, they organized the Servicemen Morale Corps, providing service people free meals and entertainment, along with recognition of their military service through presentation of certificates and war decorations. As time went on, however, the club would eventually require the financial help and support of others. Allowing actors to learn their craft was an important part of the Masquers. Besides putting on skits at the club for members, the group offered performances around town as well as holding acting workshops. In December 1949, the group held classes and then graduation for Hollywood’s School for Santa Clauses, teaching men how to portray the lovable St. Nicholas when appearing in stores, parades, and the like. Walter Catlett, Ralph Murphy, Wallace Ford, James Kirkwood, and Percy Helton took part in the ceremony. A Masquers matchbook, courtesy of Mary Mallory. During 1949 and 1950, the group also offered legitimate theatrical revivals of plays at the El Patio Theatre and other locations featuring club members. Dane Clark starred in “The Front Page,” with John Qualen, and Fred Clark in supporting roles. At the Biltmore, Richard Denning and June Lockhart starred in “John Loves Mary.” Paul Kelly starred in “Command Decision” and Otto Kruger appeared in “Accent on Youth,” the only profitable production. On February 18, 1950, Fred Clark and Peggy Weber starred in “Shadow of a Fun” at the Masquers Clubhouse. As they told the June 27, 1949 Los Angeles Times, productions helped raise funds for building a theatre in Hollywood and also for providing work and experience for members. The Masquers celebrated their 25th anniversary on May 25, 1950 with a giant program at the clubhouse, attended by 300 members. Organized and led by Charles Coburn, Antonio Moreno, and Alan Mowbray, the two hour program lauded and lampooned the group, and also celebrated the lives of recently passed members Sid Grauman and Alan Hale. In 1952, the Masquers held their first Revel in twenty-four years at the RKO Pantages Theatre, September 24, 1952, to benefit the Motion Picture Relief Fund. Spoofing themselves and entertainment as a celebration of the 200th anniversary of the American Theatre, the acts parodied minstrelsy, Ziegfeld shows, Nickelodeon Days, Talking Pictures, and Television. Joe E. Brown and Harry Brown coordinated the show, narrated by Ronald Colman. Headliners included Jack Benny, Danny Thomas, Eddie Cantor, Edgar Bergen, Phil Harris, Jack Carson, and William Bendix. Ziegfeld girls included Virginia Mayo, Ann Miller, Debra Paget, Elaine Stewart, Rhonda Fleming, Piper Laurie, and Ellie Drew. Regular performers included Alice Faye, Nelson Eddy, Buster Keaton, George Burns, Charles Coburn, Dan Dailey, William Demarest, Art Linkletter, Mickey Rooney, Jane Wyman, Charlton Heston, and Gene Nelson. The group raised $25,000 for the fund. The group continued their good works of entertaining and supporting charities by expanding their generous nets to others. In June 1950, the group sent a small contingent of members such as Alan Mowbray, Forrest Tucker, James Kirkwood, and others to entertain children six to thirteen at the Los Angeles Orphanage. All children received favors and ice cream, and then in turn presented the men with Father’s Day cards they had created. On November 29, 1950, the group produced the Starlight Revue to raise money for the Spastic Children’s League. On December 20, 1953, the group hosted 100 children from New Hope orphanage at the clubhouse where they could meet Santa and receive presents, another program which lasted for years. The Masquers also sent small bands to hospitals and jails to entertain and visit with those in need. 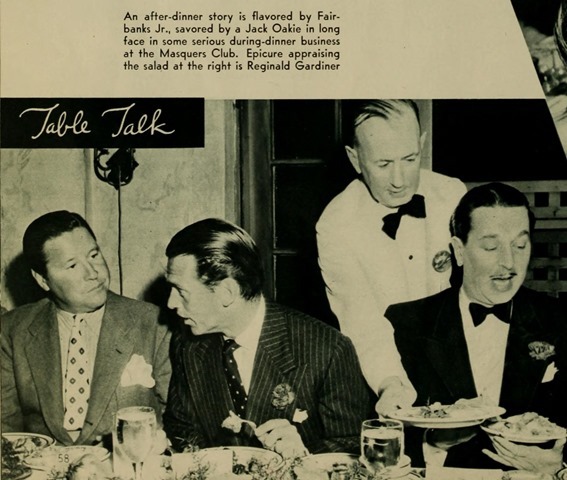 By the late 1940s-early 1950s, the Masquers began holding regular testimonial dinners honoring stars for their contributions to the entertainment industry as well as their supporting work of charities. As Bill Hardwick noted in a November 2, 1975 Los Angeles Times article, the group held testimonial dinners as a way to try and raise funds for the organization, though after expenses, little sometimes came in. They honored Gracie Fields as their first female honoree in 1949, and Jane Wyman as their third on December 16, 1952. Toastmaster Art Linkletter hosted festivities, at which Wyman sang ‘Red Rosy Apple” and “My Honey Man” to her recent husband, Freddie Karger. She received the George Spelvin Award, which was named after a fake name actors employed on playbills when appearing in two roles in a play in order not to be credited for one of them. Other people receiving Spelvin Awards in 1952 included Humphrey Bogart, Karl Malden, and George Stevens. The dinners occurred for decades. The group also honored baseball greats in the 1950s, starting with Casey Stengel, Joe DiMaggio, Hank Sauer, Gil Stratton, Leo Durocher, and Duke Snyder February 2, 1952. Stars such as Bing Crosby, Adolphe Menjou, Bob Hope, Pat O’Brien, Jerry Lewis, Dennis Morgan, and Ernest Borgnine headlined the entertainment. The group also began renting out their facilities to other organizations as a way to pay the bills, as they began dealing with declining membership due to things such as the development of television, the rise of sports leagues, and increased opportunities for activities/classes for kids, which diverted men from club activities. The Masquers, like other social organizations, gradually began seeing older members dying without an attendant number of new, younger members taking their place. The Television Film Association began holding monthly meetings at the Clubhouse in the late 1950s. The Variety Club Tent moved its headquarters to the Masquers Clubhouse per the June 5, 1958 Variety, staying three years before moving downtown. They even offered free acting workshops in the early 1960s, hoping to lure younger people into the club. Tragedy struck at the club, November 25, 1957, when silent silk-hat comedian Raymond Griffith collapsed and died after dining at the Clubhouse. The group announced plans throughout the 1960s and early 1970s about building a new clubhouse and theatre, but funds dwindled with declining membership and increased repair fees. They were forced to take a mortgage to help cover costs. On its 50th Anniversary, the club mobilized a membership drive in November 1975, offering a break in dues for those under 30. They tried to remain positive, with Bill Hardwick telling the Los Angeles Times that the Masquers was “not an old folks’ home.” Unfortunately the club began dropping into debt. They still needed to reach out to others for help paying bills. Stars donated funds, as well as items for an auction November 6, 1980, at the Sportsmen’s Lodge in Studio City to help pay down the mortgage. Nothing seemed to stop the bleeding, and the club was forced to sell the clubhouse to pay off the $300,000 debt, per harlequin Joe Caruso. After a nine-month escrow, Urban Pacific Development bought the property for $475,000, intending to tear down the building to construct a 40-unit apartment building. They held a moving sale April 25, 1985, selling off some things, but moving the murals and memorabilia to Milt Larson’s Variety Arts Center downtown. The Club eventually disbanded. Army Archered wrote in his March 22, 2004 Variety column that “young William Malin” was named harlequin for the revived Masquers. Malin is working to raise the profile and reinvigorate the club with new members, so that it can continue to help others for decades to come. This entry was posted in Film, Hollywood, Hollywood Heights, Mary Mallory and tagged film, hollywood, Hollywood Heights, Mary Mallory, Masquers. Bookmark the permalink. I wonder what became of the Batchelder tile around the fireplace in the room just off the main floor entry?